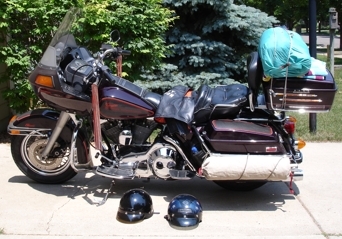 I bolted my home-made tour pack onto the back of the '87 Harley FLTC and we loaded up our clothes and camping stuff for a little get-away. I made sure to bring a helmet this time, because Michigan's governor recently vetoed their no-helmet law. I put a new set of tires on the bike last week, and it is looking pretty good for having 88,000 miles on the odometer. We gassed up and headed out. It was nearly noon, but we didn't have far to go today, and it was nice to have the morning to get ready at a leisurely pace. We headed down state highway 93, destination Trempealeau. Highway 93 is a nice two-lane road that goes through some beautiful farming county with rolling hills. We stopped in Arcadia for a snack. Arcadia owes its economic survival to the influx of Mexican immigrants that work at the local furniture factory and chicken processing plants. Even so, there are "jobs available" postings everywhere. Then, it was southbound to the old Trempealeau hotel to get Blue Oyster Cult concert tickets. We got a pair of tickets then headed two miles along the Mississippi river to Perrot state campground. We set up our tent and walked along the river back to Trempeleau. We got a good seat on the grass and had a couple of beers as we waited for the music to start. I've always liked Blue Oyster Cult, so it was fun to see them up close and personal in this intimate outdoor setting. A railroad track runs along the Mississippi right behind the stage. The passing trains would honk their horns and the crowd would cheer. It was a blast, and the sound was excellent. Later in the set, the mayfly hatch began. The number of bugs was incredible, and the band could not continue. I'm sure they would have done an encore, but the bugs flooded the stage, attracted by the lights. The bugs were everywhere! Cars could barely drive, their lights and windows plastered with the critters. It was pretty funny, and these bugs don't bite. It was a fun walk back to Perrot park at about 1:00 am. A sliver moon reflected off of the Mississippi, and there were fireflies as well as mayflies. The next morning we would see see shopkeepers using snow shovels to remove the piles of mayflies from their storefronts. I guess the swarm even showed up on LaCrosse's weather radar. We took it easy that day, heading northeast across Wisconsin to Oshkosh. We rode around Lake Winnebago, then found a motel in Oshkosh. I must have gotten into some poison ivy picking berries in Trempealeau, and I was starting to itch. I will spare you the pictures, because it was not a pretty site. It would spread for weeks before it finally abated. Somehow, Julie didn't get any on her. Oshkosh seems to be dominated by huge non-descript suburban churches and detention facilities. I was not impressed. That night, a bottle of pop got jammed in my fairing so that I could not open the storage compartment, so I took the bike out by myself and hit as many bumps as possible to free it up. That actually worked! We headed for Manitowoc to try to catch the ferry across Lake Michigan. We got there just in time to stash the Harley below deck. Sometimes things just work out, even without prior planning. This boat is the last operating coal-fired ferry boat on Lake Michigan, or so we were told by the friendly crew. From left to right: Looking down from the deck as the ferry pulled away from the dock, view from the deck, and some ships rigging. The trip was excellent. We talked to another couple that were carrying a motorcycle across the lake. Later, we saw some ships in the distance. 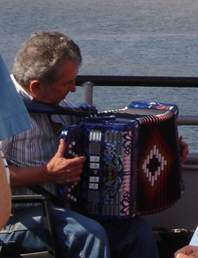 There were even a couple of guys playing accordians! It was a nice trip. When we got to Ludington, Michigan, we looked for a campsite and ended up at a city campground. We met some other riders and had a few beers around the campfire. We would see them again later with their bronze Gold Wing, lost like we were. Once you get into northern Michigan, you are just supposed to know where you are going. There aren't too many roads or people anyway. I'll have to fill in some details later when I can access my photos again. Heh. That monkey would haunt my dreams!!! The next day the weather was that beautiful scented summer breeze that Michigan gets. We headed up the Lake Michigan coast through Traverse City up north to Mackinaw. We stopped at Sleeping Bear Dunes National Lakeshore. Mackinaw was kind of a tourist trap and the front desk gal at the first motel tried to rip us off, but we ended up at an OK place after a couple of attempts. The next day we headed north over the Mackinaw Bay Bridge. That was "crap in your pants" time with the high winds, see-thru metal grates on the bridge, and a blond nut-woman on the back of the bike trying to stand up and take pictures. Later we went north to the beach in Grand Marais. I could spend days by the water there.